WHAT LIVES IN ANTARCTICA AND HOW DO THEY SURVIVE? mosses), microbial life (bacteria and fungi), and a few hardy insects. vertebrate -- can survive the Antarctic winter. enormous quantities of fish, squid, and krill. characteristic of the area push the harsh temperatures down even further. horizon, making an already inhospitable environment even more cheerless. to become better suited to this environment. that survive do so because they get their food from the sea. -Very important form of plankton or sea life. -Provides food source for most of the other life forms. along with krill, the basis for the Antarctic ecosystem. Antarctic Convergence (where the colder water meets the warmer water). exploited to any degree for either their skins or animal products. -Reaches nine feet in length and can weigh as much as 900 pounds. have developed the ability to dive to great depths. -No predator except man (occasionally killing to feed sled dogs). -Not as big and form family groups. -Most abundant of the seals, feeding on krill almost exclusively. -Largest of the Antarctic seals. warm-blooded animals, as well as feeding on fish and krill. young penguins as they go to sea for the first time. -Least known of all the Antarctic seals. -Feed on fish and krill. have hair at some stage of development. can eat three tons of krill every day. -There are two types of whales:  Baleen whales and toothed whales. -The killer whale eats small penguins which it likes to tip off ice floes. species occur in the cold temperate, subpolar and polar waters. close to the Equator at the Galapagos Islands. 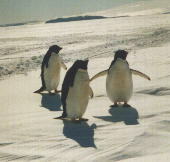 Emperor, Adelie, Chinstrap and Gentoo -- breed on the Antarctic mainland. Most of the others live on rocky islands in the Antarctic Ocean. possible that long ago they could fly, but we don't know for sure. Chinstrap, and the Macaroni penguins. wings for obtaining its food. in from the sea, shortly after the sea ice has formed. (the middle of the bitter Antarctic winter). and so kill the embryo. sea, so she can get food and winter at sea. skin for the next two months. bitter winter on the Antarctic continent. at the colder, exposed edge of the group for too long. carefully passes the egg back to the mother penguin. 40% of his body weight. feeding the chick, which quickly grows larger and stronger. penguins leave the rookery and walk to the sea. only one out of four chicks lives to become an adult. waters where they swim and fish and fatten up. -Are similar to the Emperors but smaller. lemon-yellow or white breast and abdomen. and squid which they catch below the surface of the water. -All belong to the genus Pygoscelis. white with long brush-like tail feathers. -Not common in the Antarctic. many others which more closely resemble our idea of what a bird should be. -The largest group of seabirds in the Antarctic are the petrels. wing span of 12 feet. as great as 100 mph. flies farther in its migration than any other bird known. fleeing the northern Arctic winter to enjoy a brief Antarctic summer. or in cracks on high, rocky cliffs. really live on the land are insects. sides, in spots that are sheltered from the wind. -The insect eggs stay frozen all winter, and thaw and hatch the next year. fertilized by bird excrement -- called "guano." about six mm long (about 1/4 inch to 1/2 inch). species have adapted to the environment. behavior of an organism that helps in its survival or reproduction. -- the Antarctic sea is filled with food. feet in the air, and landing on the ice where it is safe. them to their life in the cold Antarctic. and close fitting and also provide insulation against the cold. insulation and resist wind movement. helps to keep body heat in. (2-3 cm) and Adelies (1-2 cm). efficiency, outward flow of heat is very slight. warmed by the body temperature. water layer which reduces heat loss. conservation -- seals are able to undergo prolonged periods of fasting. from freezing that enables them to live in cold, deep water. as water provides yet another kind of insulation. how each enables a life form to better survive in the cold. Antarctica other than a few insects. -Insulation for keeping warm -- blubber, hair, feathers. -Flippers for swimming -- to obtain food and escape predators. -Ability to survive in water which helps keep them warm. -"Antifreeze" in circulation system of fishes to prevent freezing. -Anatomical adaptations for ease in obtaining food. -Pictures or drawings of Antarctic life forms (5th/6th grade). -Pictures or drawings of life forms not found in Antarctica. them freehand on an artists' large sketch pad). -8 oz. yogurt containers with lids. -24 oz. cottage cheese containers with lids. -Heavy winter thermal socks, mittens, or scarves. -Orange or yellow construction paper. Note:  The following information was obtained from a "clinical interview"
inhabitants of the ocean and continent's edge. bear is a consistent misconception. 2-Birds couldn't live there because there is nothing to eat. seemed surprised to realize the penguin was a bird. that everything eats fish (i.e. fish are the only food resource). Note:  Use this assessment in a cooperative grouping manner. direction of travel and locate the approximate present location. explaining how the groups think they work. ideas as the basis for a beginning activity. WHAT LIVES IN ANTARCTICA AND WHEN? forms are found in Antarctica and when. -Begin with questions developed from the assessment activity. -Whales migrate there to feed on large populations of krill. -Seals remain there year-round but predominantly in the Antarctic waters. -Seabirds spend part of their life there. -Fish are in the waters in abundance. -Krill provide the main diet for the other animals. in the Antarctic, specifically polar bear, reindeer, wolves, and moose. that polar bear  are a Northern hemisphere life form. This could be done in cooperative groups. in Antarctica and When?" without worrying too much about the adaptations. each life form) -- teachers use discretion. -Teacher can use this information for further Socratic discussion. -Three 250 ml containers with lids (8 oz. yogurt cartons, for example). -Piece of winter clothing such as a heavy sock, a mitten, or scarf. -Saline solution at room temperature. To see how animals adapt to long-term exposure to cold. 1-Mark the small containers 1, 2, and 3. These represent your "animals." "animal" should be the same temperature. 4-Insert the thermometers and close each lid. weather adaptations (blubber layer and fur/feathers layer). will stay the warmest? Which "animal" do you think will cool the fastest? (this can be changed if teacher chooses). results would be much more dramatic if students work outdoors. 9-Record temperatures in form of Data Table 1.
insulator. How do you think the Antarctic animals make up for this loss? container (to represent an animal surrounded by salt water). think the animal will stay the warmest? 5-Draw a second graph with a line for each animal as before. 3-What temperature will eventually be reached by both "animals?" this chemical help the fish survive? To see what effect "antifreeze" has on a liquid in very cold temperatures. 1-Mark the test tubes 1 and 2. These represent your "fish". water into test tube 2. 3-Carefully measure 5ml of antifreeze and add to test tube 2. 4-Pack ice/rock salt mixture into beakers - about three quarters full. 5-Put a test tube into each of the beakers. 6-Ask students for predictions at this point. physical change in one, or both "fishes." a-What effect does the antifreeze have on the liquid in the test tube? behavior to occur in an animal under observation. should be large enough to sit in). -Orange/yellow construction paper to make penguin bills. -Glue, tape, etc. to make the penguin bills. -Notebook of paper for recording observations. 3-Roles and Observations -- "Penguin" -- the student will sit on the "nest"
during the high traffic time without making any comments to passersby. results could then be combined and a conclusion reached. 4-The observation time should last about ten minutes. 1-What happened to the pulse rate of the student under observation? 2-What kind of behaviors did the student under observation exhibit? 3-What kind of behaviors did the "observers" exhibit as they passed by? practice applying their new knowledge. Note:  This can be done as a cooperative group. years later, the dogs are reunited for sled dog training. -How does fur on the stomach help the Antarctic dog? -How does fur on the head, back, sides, and legs help the California dog? -How does lack of fur on the underside help the California dog? This can be performed individually or in a cooperative group. -Think about the adaptations you have learned about. -Draw and label a diagram of your new life form. -If time permits have students make a paper mache model and paint it. 2-What adaptations enable the life forms to survive and how do they work? 3-What are the similarities and the uniqueness of the adaptations? 4-How are the Antarctic life forms and Arctic life forms alike? Different?